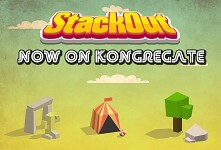 Stackout - enchanced version with 4 new levels live on kongregate ! We figured our first important step to a more mature release of Stackout would be to improve on what we have in a short time and spread that out on bigger platforms and therefore we decided to target kongregate first and foremost. So today marks the exciting announcement of just that. We worked ouf backs and fronts off and on to bring you the first iteration of the Stackout experience, with 4 brandnew levels and a lot of bugfixes and tweaks, that mostly make the game a lot more fair to everyone, since people said it was quite a tough game to master ! Click the image to get straight to the stackout kongregate headquarter ! We would love to hear your thoughts and feelings on this iteration of Stackout, so we can make our brain freeze once more on the next brainstorming session. We enjoy the direction they are heading in very much and are sure to explore that even more in the next weeks ! Hey guys! 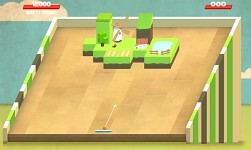 As CFrac said half a year ago i also would really like to play this one on iOS. Still in love with Stackout! A mobile phone version is something we are very eager to tackle within this year. And achievements of course, as well. We needed to leave a lot of planned content out for the contest deadline. Just finished playing with the Mac version and decided it would be an awesome purchase if it was released for iOS on the app store. Add some nice achievements and it will be great! for some reason I'm not getting better at climbing flail by @Korigame - I guess it's because it's broken....must.keep.telling.me.that.